We have already given an introduction to substation earthing system in an article published earlier. Today we are going to discuss about the design of substation earthing system. 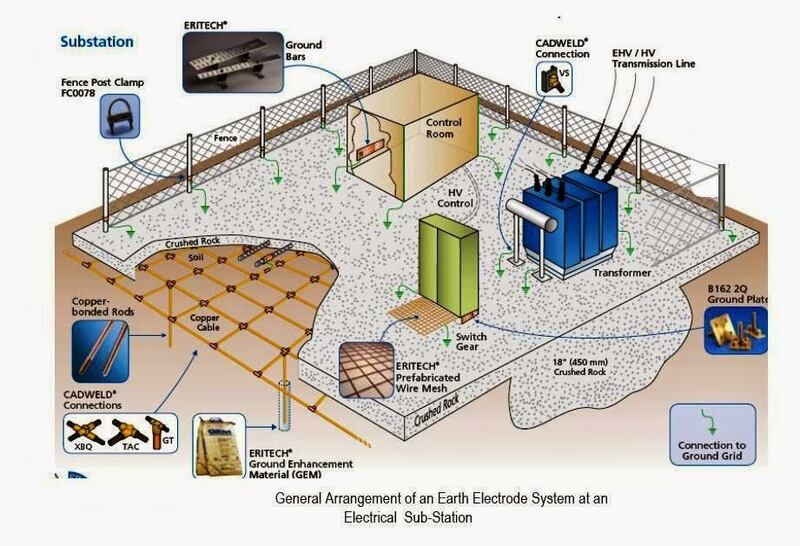 Before 1960s the design criterion of substation earthing system was “low earth resistance.” (Earth Resistance< 0.5 ohms for High Voltage installations). During 1960s, the new criteria for the design and evaluation of Substation Earthing System were evolved particularly for EHV AC and HVDC Substations. The conventional “Low earth resistance criterion” and Low Current Earth Resistance Measurement continues to be in practice for Substations and Power Station upto and including 220 kV. 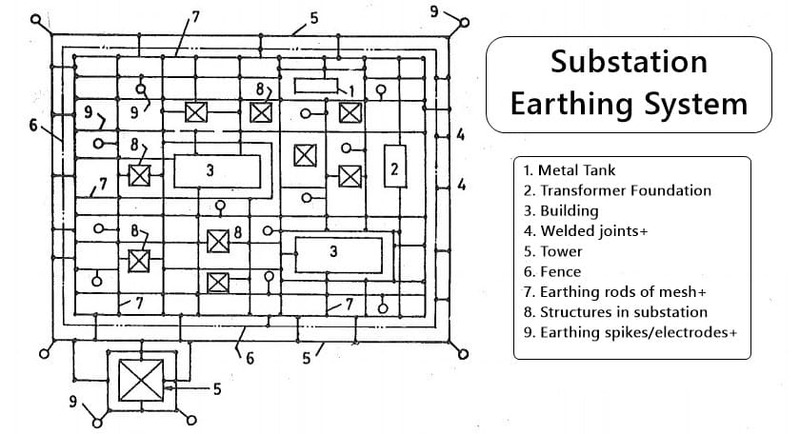 The parts of the Earthing System include the entire solid metallic conductor system between various earthed points and the underground earth-mat. The earthed points are held near-earth potential by low resistance conductor connections with earth-mat. The mesh is formed by placing mild steel bars placed in X and Y directions in mesh formation in the soil at a depth of about 0.5 m below the surface of substation ﬂoor in the entire substation area except the foundations. The crossings of the horizontal bars in X and Y directions are welded. The earthing rods are also placed the border of the fence, surrounding building foundations, surrounding the transformer foundations, inside fenced areas etc. The mesh ensures uniform and zero potential distribution on horizontal surface of the ﬂoor of the substation hence low “step potential” in the event of ﬂow of earth fault current. Several identical earth electrode are driven vertically into the soil and are welded to the earthing rods of the underground Mesh. Larger number of earth electrodes gives lower earth resistance. i.e., approximately 250 Amp per spike, for soil resistivity of 500 ohm-meter. i.e., approximately 500 Amp per spike, for soil resistivity of < 5000 ohm-meter. These are generally mild steel rods bent in vertical and horizontal shapes and welded to the earthing mesh at one end and brought directly upto equipment / structure foundation. These are used for final connection (bolted/welded/clamped) between the Earthing Riser and the points to be earthed. For Transformer Neutral/High Current Discharge paths copper strips/stranded wires are preferred. Galvanised Iron Strips/stranded wires are more common for all other earthing connections. The earthing strips are ﬁnally welded or bolted or clamped to the Earthed Point.